Nigeria international striker Uche Nwofor believes his move to Belgian side Lierse S.K will aid his progression as a player. The Super Eagle has sealed a one-year deal with Lierse after his contract with Dutch club VVV-Venlo ended by mutual consent. Nwofor spent last season on loan at SC Heerenveen. However that spell in the top-flight was blighted by injuries that limited his playing time. "I hope I can make a good contribution here at Lierse and help improve the club," Nwofor told BBC Sport. "It should be a great experience for me in the Belgian League so I'm really looking forward to it. 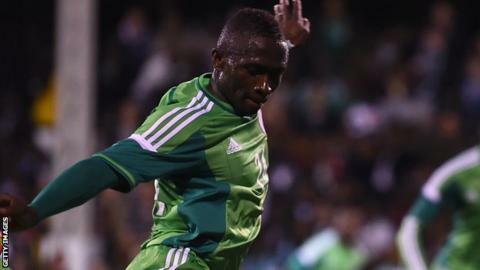 The 22-year-old was part of Nigeria's World Cup squad and played in their shock 3-2 home defeat by Congo in the African Cup of Nations qualifier last Saturday. Nwofor, who has scored three goals in six appearances for Nigeria, believes playing regularly in a top-tier European League will improve him as a player. He added "The Belgian league is competitive; it gives me a chance to get better and also make big progress in my career. "I feel right now regular football is what I desire in my progression at a professional level. "I want to talk less and perform on the pitch because that is my job as a striker." The former Enugu Rangers striker is confident he can rediscover his scoring form at Lierse after enduring an injury-plagued 2013/14 season. "Injury is part of football and I was not very lucky last year," he explained. "I had to make a big decision, move to another country and league to help regain my confidence. "I realised as a national team player you have to push yourself every day and keep working hard."